….and, no doubt, other names in other places [source]. 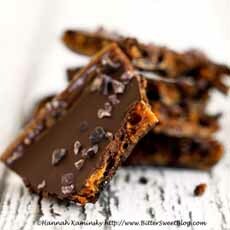 They all describe a confection that’s crunchy, crisp in the center, and melts in your mouth. While there’s no molasses in it, the caramelization of the sugar gives it a bit of molasses flavor. You can have it covered in chocolate, or not. Hannah wondered: “Where did all those names come from, and why did they keep renaming the exact same candy?” She set out on a mission to make her own. “I cooked and caramelized, stirred and stewed, bubbled, boiled, and crystallized my very own sweet. If anything, what I created was even darker and more powerful than the old-fashioned candies you can purchase. The spongy airiness of the candy is based on the middle school volcano trick demonstrated in science class: Baking soda plus vinegar equals bubbles. You’ll have a mini-volcano in your mixing bowl in Step 5, below. It’s fun, as long as you’re forewarned. As with Chocolate Matzoh, a.k.a. 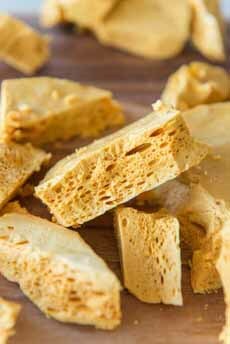 Matza Toffee, a.k.a. Matzo Buttercrunch, a.k.a. whatever, sponge candy is a treat you can make for Passover. But don’t make it in the summer heat and humidity and plan to serve it at a picnic or barbecue. If you need a fix, make it and eat it in the comfort of your air-conditioned home. Ready to make some four-chocolate sponge candy (photos #3 and #4)? 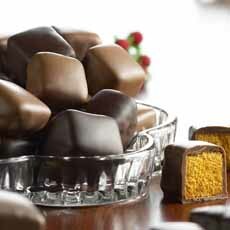 and  Sponge candy from Watson’s Chocolates in Buffalo, New York, a town famous for its sponge candy. You can find sponge candy worldwide, often under different names. This angel food candy is from Kitch Me in Australia. If you don’t want chocolate, you can make sponge candy without it. Here’s a recipe. 1. LINE an 8 x 8-inch baking dish with parchment paper and lightly grease. The parchment doesn’t need to fit perfectly inside the pan, as long as it covers the bottom and sides without any holes for the liquid candy to escape through. 3. MIX together the remaining tablespoon of water, cocoa powder and chocolate extract in a small dish; set this cocoa paste aside. 4. COOK the sugar until the mixture is caramelized and reaches 300° to 310°F, also known in candy-making as the hard crack stage. Remove the pan from the heat. Things will move very quickly from here, so be on your toes. 5. VIGOROUSLY STIR in the cocoa paste along with the baking soda, allowing the mixture to froth and foam violently. Immediately transfer the liquid candy mixture to your prepared baking dish but do not spread or smooth it down. Allow it to settle naturally to maintain the structure of the fine bubbles trapped within. 6. COOL for at least 1 hour until fully set. To finish, melt the the dark chocolate in a microwave-safe dish, heating at intervals of 30 seconds and stirring thoroughly between each one, until completely smooth. Pour over the top of the candy base and spread it evenly across the surface. Sprinkle with the cacao nibs and let rest until solidified. 7. BREAK the candy into pieces and enjoy—but enjoy it quickly. Enjoy it within three days at room temperature, storing in an airtight container. If you’re bringing it as a gift: It’s fragile, so transport it carefully. And may we suggest: crushed or sliced sponge candy makes an exquisite topping for vanilla ice cream, or layers in a parfait. 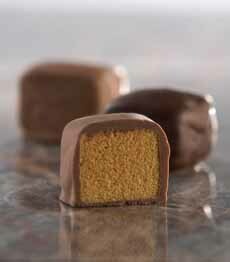 Sponge candy is known by so many different names that it’s difficult to discern where it originated. The closest we can find in English is that sponge candy was produced as early as 1913 in Beamish, a village in northwestern England’s Durham County. It was made in copper pans over an open fire. 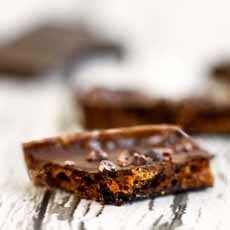 We do know that in the U.K., the Cadbury Sponge Candy Company first mass-produced sponge toffee in 1929, and created the Crunchie chocolate bar with a sponge candy center. In the U.S., the product called sponge candy took root in Buffalo, New York, which is still the sponge candy capital of the country. 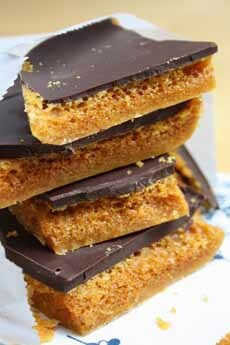 It is an airy variation of toffee with a light, sponge-like texture. Different versions of sponge candy have come and gone, as you can read in this article from an octogenarian who remembers it from 1940s New England. But look internationally, and you can find that the Turkish version, törökméz, dates back to ancient Turkish cuisine and was adopted in Hungary during the Ottoman Era* [source]. Did a candy maker from Hungary settle in Buffalo? Does sponge candy date to Anatolia (most of modern Turkey). Neighboring Persia (the modern Islamic Republic of Iran) was cultivating sugar by the sixth century C.E. The ancient Sumerians in Babylonia were making vinegar from way, way back to 5000 B.C.E. So, what we think of as 20th-century sponge candy may have been the continuation of an ancient recipe. *Ottoman Hungary was the territory of Medieval Hungary that was ruled by the Ottoman Empire from 1541 to 1699. More.